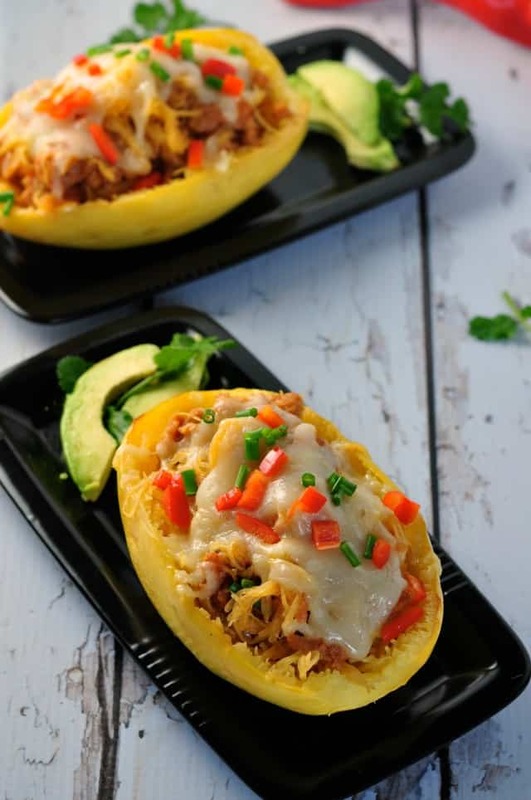 This Chorizo Chicken Spaghetti Squash is a family favourite. Zesty salsa and spicy chicken sausage add lots of flavour to nutritious spaghetti squash. Don’t you just love getting a good bargain? It makes my day. And squash has to be the best bargain in the produce section of any market. This low carb, low-calorie squash is packed full of small amounts of almost every essential vitamin and mineral, and it’s a good source of fiber, as well. My garden stores of squash are all gone, so I have to resort to buying it now. While shopping at the local market yesterday, I could hardly contain myself when I spotted . . . wait for it . . .
MINI spaghetti squash! How cute are those? Little hold-in-the-palm-of-your-hand spaghetti squash! 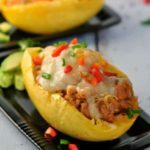 I came up with this super easy filling to stuff these little shells to make this Chorizo Chicken Spaghetti Squash dinner. Just brown some onion and garlic with the sausage, mix with salsa, toss with the spaghetti squash strands, stuff back in the shells and eat it topped with warm, melted ooey-gooey cheese. 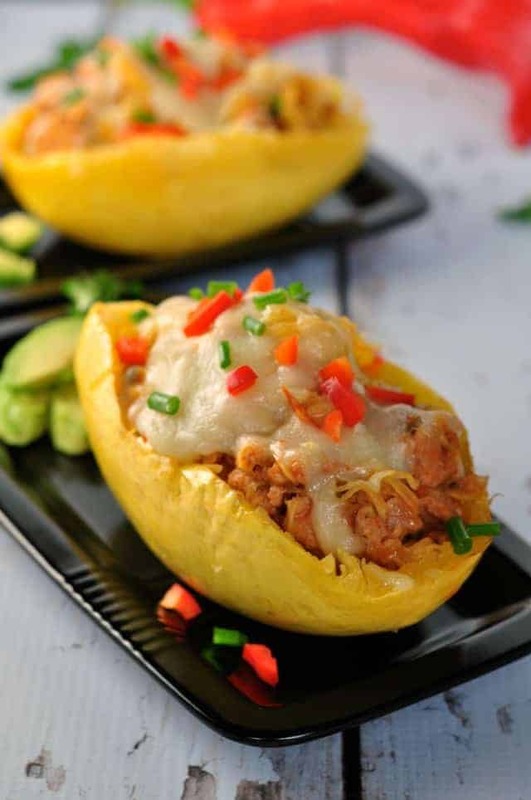 Just double the recipe if you are using a large spaghetti squash. Serve with some fresh avocado and cilantro. How easy is that? 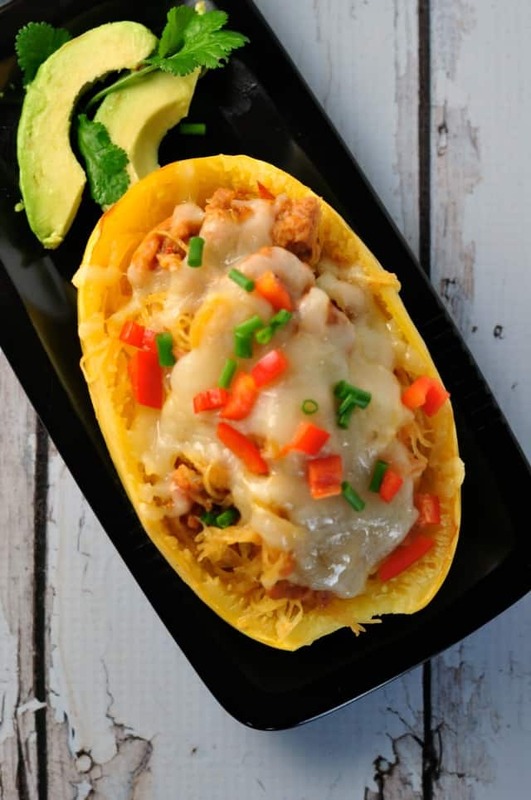 Spicy fresh chorizo chicken sausage and salsa are tossed with spaghetti squash noodles, topped with melted cheese and served in the squash shell. 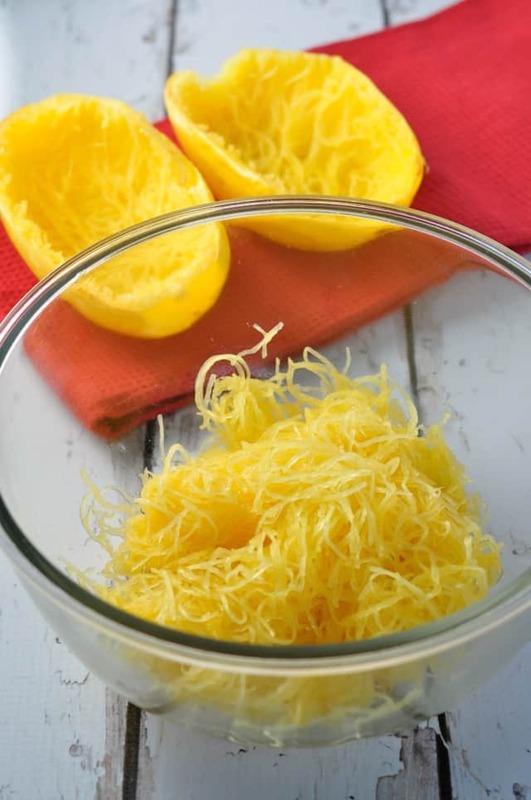 Wash spaghetti squash, cut in half, remove the seeds and stringy bits. Brush with a little olive oil and place skin side up in a baking pan. Bake for 35-40 minutes or until tender when pierced with a fork. Meanwhile, heat oil in a skillet, add onion and cook till translucent. Add garlic and chopped chorizo sausage meat and cook until browned. Stir in salsa, heat through and remove from heat. When cool enough to handle, scoop out strands from squash and place in a large bowl. Set empty shells aside. Combine the chorizo mixture with the spaghetti squash. Fill shells with the mixture, top with grated cheese and place under the broiler until melted.